Yesterday I did an excellent walk with my Jesus Green Pool swimming friend Chris. I have been wanting to visit The Henry Moore Foundation site at Perry Green, so when a 25% discount voucher appeared in the post & also prompted by Chris wanting to do a longish walk for him 🙂 (but a walk Sally & I would consider a bit short at 13 1/2 miles) . I finally made it there. We took the train from Cambridge to Bishops Stortford (equally fast frequent trains from Stansted airport & London). First part of the walk is along The Stort navigation past locks & narrow boats plus two nature reserves, although Chris didn’t have much time for bird watching, apparently walking and twitching don’t mix). After leaving the river and crossing the main line (trains every 3mins so don’t hang about on the level crossing) we made our way over to Thorley with its delightful church we had a bit of confusion at Thorley Wash after crossing the A1184, but we took the track, rather than through down the private drive, which then transforms into a delightful old coach road. We arrived at Perry Green and made straight to The Hoops for a pint & salad, a tad pricey but excellent quality. 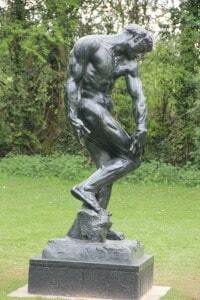 Straight after lunch it was across the road to see the Moore / Rodin exhibition of sculptures, totally stunning! & a must see. I thought artists were meant to be poor! However, according to Wikipedia he was paying a million pounds a year in income tax! Maybe we overpay for public works of art 🙂 The staff said it was OK to take photos outside so you can see some of them on Flickr. A lovely walk back via SideHill full of bluebells (Chris pondered wether they were Spanish or Native) past enormous houses and then a lovely walk into Bishops Stortford through the sports grounds of the college ( a snap at £24,000 per year for boarders).